I’m not sure what it is about wreaths, but I just love them! I think it’s their “wholeness”…the way they feel so complete. The circular shape is said to represent eternity–no beginning and no end. When I first moved into my current home 18 years ago, I continued a tradition I had started at my previous home…that of hanging wreaths outside on the windows at Christmas time. I was the only one in my neighborhood doing this, but with each passing year, more homes have joined in. Now a lot of the homes on my street decorate this way. I’ve never thought of myself as a trend setter, but I think I may have started something here. If you’ve wanted to dress up the front of your home with wreaths and you weren’t quite sure the best way to go about it, here’s how I do it. I lower the top sash and drop the wreath out and over. Holding onto to the ribbon, (from which it hangs) I raise the sash back up until the window is almost closed. I adjust the wreath to where I want it, close the window tight…then using a push pin, I secure the ribbon to the top of the wooden frame of the window. The pin is hidden by the window treatments. After Christmas, I just pull the pin out and let the wreaths drop to the ground where I collect them. I always put the pin back so it will be there when I need it next Christmas. Of course, it greatly helps if you don’t have window screens on the front of your home. I had all mine removed years ago, since I preferred the look of the house without them. One of the best things about hanging wreaths on the windows…is how pretty they look from the inside, too! In fact, I have to force myself to take them down after Christmas…I just love seeing them from inside the house. Here’s how they look in the guest room. Another one of my favorite places to hang a wreath is over a mirror. This one hangs above the fireplace in the family room. The round brass thingy you see sticking up at the top is part of a french horn that is incorporated into this wreath. It actually has two horns, one at the top and one at the bottom. The horns started out a brighter brass, but I like how they have aged and darkened over the years…looks better with the old mirror behind them, too. The mantel is decorated with fresh Fraser Fir clippings I begged from a Christmas tree lot…they are the scraps left over when someone purchases a tree and has the lower branches removed. I love the wonderful scent they bring to the family room. The Nandina berries came from my yard. I copied Pat (Back Porch Musings) idea and placed the faux flickering candles down inside real candles. With all that greenery…I figured this was the safest way to mix in some candlelight. 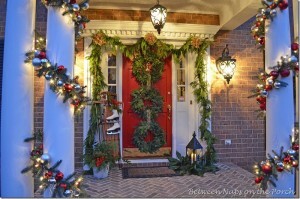 More wreaths…the sconces in the entry get a touch of Christmas. 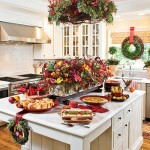 There are even wreaths in the kitchen…stole this idea from an historic home tour in Madison, Georgia. Bought this cute patchwork wreath at a crafts fair many years ago. I think Gloria (Happy To Be) has one like this. 🙂 It hangs on a pantry door in the kitchen during Christmas. This little wreath hangs on the knob of the china cabinet in my dining room. Can’t forget the doors on the screened-in porch…this wreath is covered in snow. Now don’t ask me how it got snow on it when it’s under a covered porch…must have been a harrowing, wind-blowing blizzard! If you like this one…it came from Hobby Lobby just a few weeks ago. Nothing is safe around here…even the clock in the upstairs family room gets a wreath. Last Christmas I hung a wreath on the mirror in the dining room. I liked the look so much, I decided to leave it there year ’round. It just seems to work with the mirror and the chandelier. This is the only room in my home where I don’t use any brass…only silver and crystal. No beginning and no end, life is a circle…and sometimes a square. Susan, I love all of your wreaths, especially the ones hanging on your kitchen cabinets. Your home is just lovely. If I forget…which is very likely at this time of year, please sign me up for Tablescape Tuesday next Tuesday before Christmas! I think my favorite wreath… If I had to choose from your lovely photos… is the one in your dining room over the mirror that you leave up year round! Who days wreaths are only for the holidaze? 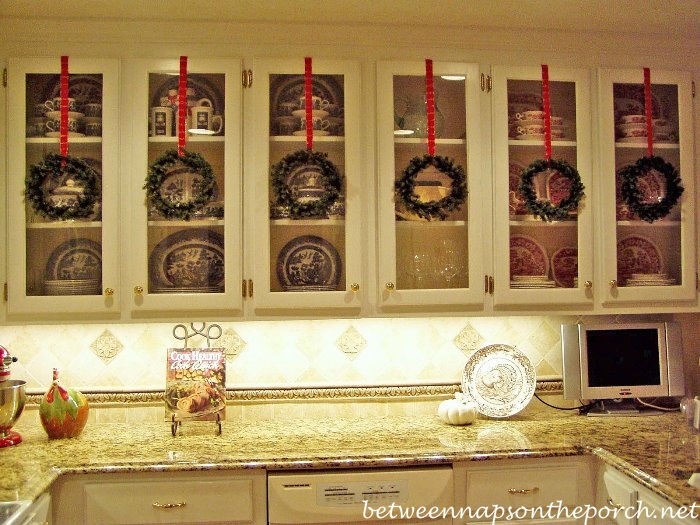 I have always had wreaths on my windows, but never on the wall of cabinets, it wonderful! Love the pink wreath, an the white one! I going out to search for more gingerbread men tomorrow! Looked on line, come up empty! Going to paint a gourd one soon. I hope I win the ornaments for place cards! lol, Just a wish! I am going to set the table in my peppermint dishes and gingerbread, for Christmas morning! We always have the girls and their hubbys and grandchildren for pancakes, bacon ect., after they open santa gifts with their children. Then off to my Daddys. No offical meal here, even Christmas eve, we will go to Hubby’s uncles. Love all your Christmas deco. Its all so lovely! I hope you keep tablescape up, I do love it! I put it on my side bar. I do enjoy it so. I thoroughly enjoyed the tour! Loved the wreaths. My next door neighbor has her wreaths like that and I keep admiring it as well. Her house is all white with black shutters and a cherry red door. It is really lovely. Please sign me up for TT. Ok, I have so much to say, it will probably take me 3 comments to remember it all b/c I’m semi-A.D.D.! 1st, your C-mas china looks fab in the cab! Is that a Santa I see in the gravy boat – if so, love him! If not, I need new glasses or more sleep! 2nd, always have, always will, love that wreath in that fabulous red dining room! It’s just AWESOME! ALL the wreaths are pretty, but I LOVE the Hobby Lobby wreath – I think something’s just been added to my TO DO list! Love the family room wreath too…it’s just so perfectly southern (your entire house!) I’m convinced you live in Kevin’s house (Home Alone! ), and you’re just not telling us! LOL! Susan, I love the richness and tradional statement your home makes, without being stuffy and unlivable. It is so well-appointed and you get a sense of the thought you put into everything you do. As always…inspirational!!! Thanks for putting together such a great blog for us to enjoy. Oh and I make my own wreaths and will be making many more for next year thanks to your ideas!! Love all the wreaths everywhere. I have always wanted to hang them outside, but I am afraid many of the windows on this 20 year old house are probably painted shut! I am going to make a note of it in my Christmas Notebook and add it tomy spring/summer project list (getting the windows open,lol). One of the things that kept me from hanging wreaths was the thought of climbing to install them…but if all I have to do is open the window….well, I can manage that by next Christmas! Thanks for the instructions! I am inspired by your wreaths but have really different windows but if I am really clever. Also I want to do the kitchen cabinet ones next year. They would complement my kitchen hopefully as much as it does yours. I know…I’m like a bad Penny, I just keeping showing up (bad joke, I know!) Anyway, forgot to say, that kitchen wreath gave me an idea of how cute it would be to make a candy corn wreath for Halloween similar to it…not that I can sew worth a hoot, but you gave me some inspiration! LOL! Everything is just outstanding, Susan! Your mantle is breathtaking–I love the addition of the books. Will you be doing Tablescape Tuesday this week? If so, I’m in! I love wreaths too and the traditional way of hanging them in the window…, the pink one is awesome! I’d love to make one eventually with shells. I love every moment I’m invitied into your home I love the silver wreath. Your home is so beautiful, you must be so proud. Hi Susan…Thanks for another tour of your Beautiful home. 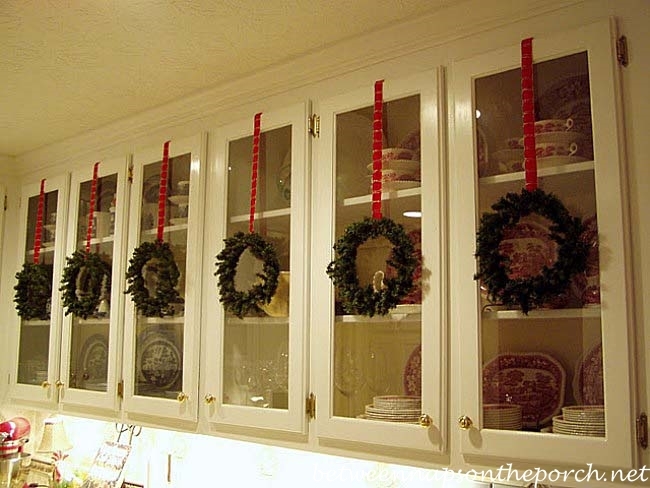 This is the first year (I don't know why) we hung wreaths w/red bows on our outside windows & it makes such a statement…especially during the day when the lights aren't on… I LOVE your kitchen cabinet wreaths! I love all of your wreaths, Your home is just lovely. I never thought of putting a wreath over a mirror, but I’d like to try it. My only problem is just how to secure it in place. Wow! Your wreaths are so beautiful all over the house. Where do I start. I love love love your mantle it is gorgeous & your dining room is also gorgeous. I love the red. What a beautiful home. Oh, Susan! I love all your wreaths! I can’t pick a favorite! I, too, love to hang wreaths in unexpected places…I even have some I’ve done with springy pink flowers that I hang or set in different places when winter is over. Thank you for sharing the beauty you’ve created! I’m in for TT, too! SUSAN,YOUR WREATHS ARE AWESOME.AS IS YOUR HOME,BUT I NOTICED YOUR CARDINAL DISHES.SEE,YOU’VE GIVEN ME A CYBER-DISH -BUG.OH MY.IT IS ALL YOUR FAULT.I AM GOING TO POST ON TUESDAY WITH YOU,OKAY…. Just Lovely. I agree the silver one in dining room has my vote too, although they are all lovely. Wow! Everything is so pretty. I need to check out Hobby Lobby , but I have a feeling the traffic and crowds will really be bad today. Your home is beautiful. Gorgeous! I love the square wreath, I like to make wreaths in unexpected shapes…Still no beginning or end, but unique! You must have one of the lovliest and most inspirational homes ever! I could roam through your rooms for hours on end. Hi Susan, I know I have said it before but shall say it again “you never fail to delight”. 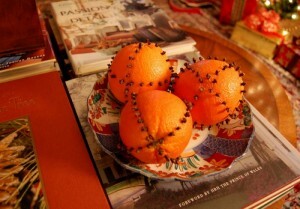 I haven’t visited your blog for a couple of postings, but did today and oh what a ‘festive holiday feast for the spirit’. From the delicious recipes, tree trimming and wreaths; its been an absolute wonderful Holiday Tour. You have a beautiful home, it should be featured on a magazine! I love your trend setting idea! That wreath that you bought in the craft fair? I have one that I made many years ago exactly like it! I love mine. Thank you for sharing. Happy Pink Day! Oh my, that shall prove interesting! OK, you easily have the most wreaths I’ve ever seen in/on one house. Your house looks gorgeous with them! I don’t know about letting drop to the ground outside though. I could see ten years down the line, my roof would be littered with wreaths from days gone by. Yes, Susan please add me for next tuesday for the tablespace. I, like you think you can plop a wreath just about anywhere and it looks nice with any decor. I did the small wreaths last year in the kitchen. This year kept it more simple. Well Susan, I think you’ve got me beat…..I put up 29 wreaths every year, but I’m sure you have way more than that. Your decorations are wonderful and I love the way you did the dining room. Thanks so much for sharing. I love all the pink! Your house is so festive! The wreaths look like something out of a home decor photo shoot. Gorgeous! I love all your wreaths. You have a lovely home and your decorating is just perfect! Merry Christmas! You always wow me with your tablescapes, but your entire home does the same. Everything is so wonderful and I always keep going back to see the little details. Thank you so much for the inspiration to keep on decorating my home. I just love your home – everything about it is beautiful! Susan, your wreaths are amazing! I was by earlier and evidently didn’t leave a comment. I knew you did the wreaths on your outside windows, but had no idea you had so many inside. I like them all, but my favorite is probably either the one in the family room or the one on the clock in the upstairs family room. The pictures from the inside are marvelous. The kitchen looks great decked out also. every idea you gave about the wreaths were great and new to me…..thanks so much. 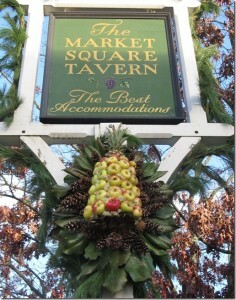 I really like the square wreath, thats a first for me…but not the last for I must make one of those right away. Wishing you and your loved ones a wonderful Holiday Season. Great wreaths. They really are timeless and classic. I have a hard time letting go of all of the Christmas decor, I just may become one of those crazy old ladies that leave it up all year long ! ( my kids will not put up with this, I fear).. Your home looks great, I really enjoyed the tour. I know that you have more to show us, so give it up! all your decorations are beautiful, love the kitchen! Happy Sunday, Susan. As you can see, I am still making Pink Saturday rounds. 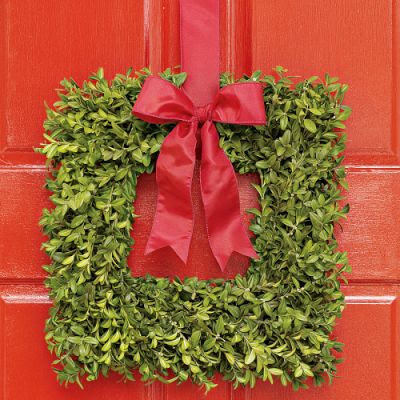 I love all of your wreaths, and agree that they are such a lovely symbol during the holidays and year-round. I love seeing wreaths on colonial type homes such as yours. It is just so simple and elegant! No wonder other people in the neighborhood followed after you and started putting up their own wreaths! Absolutely adorable and picture perfect! Thank-you very much for your beautiful blog. Last night I made your champagne punch for my guests and it was a huge hit! Again, thank-you and I look forward to more posts. Happy New Year!!! Cindy, in cold and snowy Wisconsin. BEAUTIFUL SUSAN!!! I just love your venetiian mirror with the wreath…thank you for the inspiration!